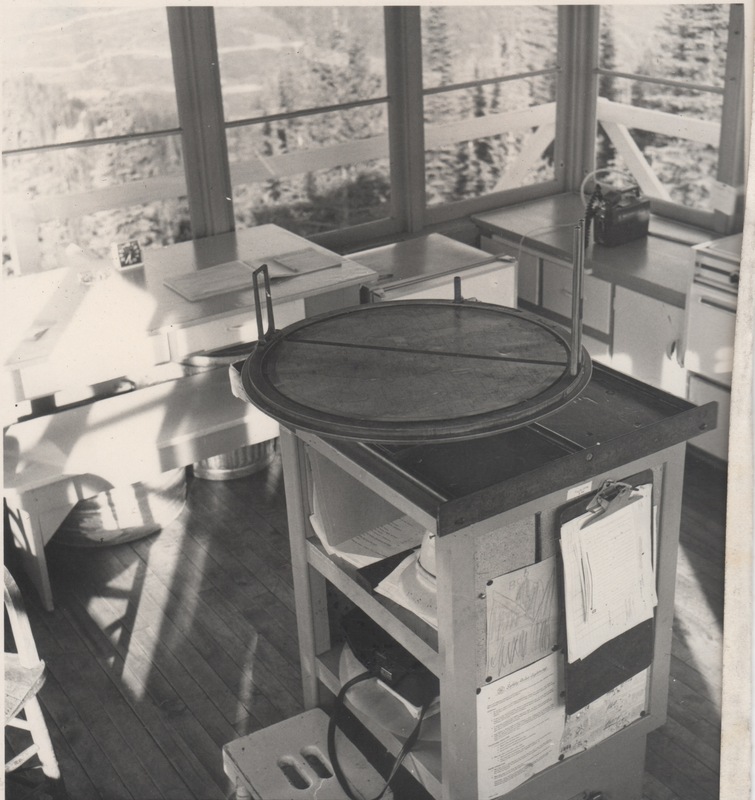 My fire lookout job had its roots in high school in Dillon, Montana, in 1967. My friend Tad told me he had a job as a lookout for the Forest Service. He was a good friend who used to get into trouble with me and my peers. Yes, I know one wasn’t supposed to do drink alcohol. Nor chew tobacco, nor smoke, but we did all of those things. Except I didn’t smoke because I didn’t know how. Actually, I didn’t chew then either, because it made me sick. Anyway, Tad showed me where the Beaverhead Forest Office was and I got an application I filled out right there. In those days the form was only a couple, maybe 4 pages, long. I got a job planting trees out of Sheridan, Montana, in 1967. I lasted about a week. Obnoxious men, just out of the army, made staying impossible for me. Several of us were just boys, out of high school, and these others, these foul, nasty, noisy, dominating jerks filled up the silence with their card playing and cursing. I hated the way the a loud one walked around brushing his teeth. I never went back after the first week. My mother had just bought me a pair of logging boots that were hard to walk in. Well, they felt like they had high heels. My new jeans chafed and stunk after a couple of days. I was homesick, away from home, with the losers. We were all losers, I thought. I did get a job the next year with the Forest Service on a fire crew, to be stationed somewhere in the Beaverhead Forest. I had the same problem, being unable to stand my fellow workers, but I got official USFS training! I also saw some of the other guys I had worked with before. A set of twins, named Garven and Virgil, slow talkers, overweight, but kind to each other. Oh, they kidded each other and bickered, but mostly they were kind. I learned later that they had stayed on at Sheridan planting trees. They told me that the noisy army brutes never returned to the crew after the first week either. From the way those army veterans had talked, I’d say they didn’t make it past the nearest bar where they probably drank themselves into a coma. In 1976 Penny and I and the kids were back in Missoula after our hippie and USMC years fixing volkswagens and getting helicopter parts for supply. In January ’78 I filled out an 8-page employment application for the USFS. First in pencil, looking up all of the little trainings and short stints with the FS, then in ink. I checked the boxes for “any position” and “any wage” and the box for “Idaho Panhandle National Forest.” I figured anything too near Missoula would put me in competition with the forestry students and faculty. In March I got a letter from Joe Hawley of Priest Lake, Idaho, with an offer for me to staff the lookout at Indian Mountain. I went huh? Not what I expected. (Maybe I would be an assistant to the real lookout for a year or two?) The wage for a GS-3 forestry aid was about $5/hr. I telephoned my acceptance. Joe assured me that bears were not an issue there. The world looks altogether good from the lookout. We were young, employed, together, surrounded by nature. In early June we sublet our University of Montana apartment and bought a bigger old volkswagen, a van. We allowed 2 days for the trip from Missoula to Idaho, slightly more than 200 miles on good highways. It’s just how we traveled then, in 2 cars, because one inevitably broke down. The 5 of us: Clara, age 3; Bob, 5; Todd, 7; then Penny and me, nominally adults, but less than 30 years old. Before we left I had Charles Seastone teach me how to use a chainsaw. I bought a plant identification book. Batteries for the radio. everyone had warm coats and sleeping bags. The kids all had leather lace up boots. This last proved to be time-consuming. We drove 2 days along the Clark Fork river to reach the rainy, cold, mosquito-infested Priest Lake station. We had nowhere to stay, so someone told us about a slightly illegal campground near Nordman. Nordman! It was a combined gas station, store, and bar with a pay phone perpetually in use with a drunk talking on it. We drove a dirt road a few miles until we found a place to camp, an area of dirt in the woods where we could pitch our canvas tent. About 150 feet away a pickup with camper had a boy, maybe 10 years old, playing with a knife. He eventually came to our camp. Said his dad had asked him to ask us to borrow our ax. I asked him to bring his dad over to ask me in person. While the boy walked back to his camp, we changed our minds about camping there. I took down our tent, put it in the VW. We drove to a place called Tule Bay on the east shore of Priest Lake, a spot that Jackson Miller had recommended, but it was, like, 15 miles from Nordman. We camped without any creepy neighbors. We had very little food or money. In one of the brief breaks from the rain of early June, we hiked to a meadow. We met a man without a shirt, white hair, wild look, turned out to be a philosophy professor from Hawaii. He grabbed a handful of miner’s lettuce from the ground and popped it partway into his mouth. “You can eat this! See?” he said. I reacted in fear. We made some canned chili on our camp stove for supper before it began raining again. We fixed a tarp. Monday morning I drove the 1960 white beat up VW bug to work. The car did a strange thing whenever I turned on the wipers. It surged, quit, surged, quit, like that, in time with the wipers. Later, I looked under the front bonnet. A handsaw up behind the dash somehow shorted the current to the engine whenever the wipers reached their maximum travel. It shorted the ignition current at the switch. If the circuit had been protected by a fuse, it was no longer, because I had long ago learned to use some aluminum foil on the fuses so that I didn’t have to buy any new ones. Because of logging on Indian Mountain the old route to the lookout was obsolete. A new logging road forked at the ridge, and each dead ended less than a quarter mile away. One ended within a half-mile of the top of the mountain, but there was no trail from there. Our supervisor had us make a new trail after he showed us the extent of each road fork. A couple days before, at the station, Jackson Miller had asked me if I could use a chainsaw. “Oh yes, I lied.” He handed me a round file and suggested I sharpen the chain. I walked over to a bench with the saw and started in. I knew what I needed to do, I just didn’t know exactly how to do it, since this was my first time. As soon as I scooted the chain to sharpen a new set of teeth, my finger slipped and made a nice deep cut in my flesh, which started bleeding. I hid my cut by holding the edges together with my thumb, but soon there was blood on the saw bar. And on the floor. It wouldn’t quit dripping, so I asked another forest service guy for a first aid kit, in a soft voice. The other guy asked Jackson, who said to me, “Oh, did you INJURE yourself?” Then he said to the other guy, “you’d better take over with the saw until we check him out with it.” From that time forward I had no chain saw privileges at Priest Lake. A confident freckled woman with great big broken-in logging boots named Babs had privileges, so she sawed and the rest of us dug with shovels and pulaskis (ax-hoes) to make a switchback trail through dense forest from the end of one fork of the logging road to the lookout. When we got within 100 yards of the top our supervisor had us abandon the switchback plan and head straight up. You’ll want to get straight to the lookout from here, he said. At Indian Mountain L.O. My sister Carol, daughter Beth Angel Rohrer, Carol Judd Sinclair, and our three: Bob, Clara and Todd. I’m in front. Note that one kid is wearing his pajamas. Penny must be the photographer. Years later, in fact just last week, Penny and I struggled six miles up a mountain in Glacier Park on a well-engineered trail to Huckleberry Mountain Lookout, and, sure enough, when we were within a hundred yards of the tower, the trail ceased its well-engineered mode and instead went straight up the mountain in brutal fashion. A youngish couple ahead of us didn’t seem to mind, but we struggled and sweated. I was well-hydrated, so when I rested on my trekking poles, sweat dripped off my elbows, making dark circles on the stones in the path. At Indian Mountain in 1978 for the first time, after the trail had been cut but before our family moved in, our supervisor turned to me and suggested that I lead the group through the brush back to the other fork in the road. As I fought through the brush he marked the new trail with ribbons. Good thing! To my amazement, we missed the road and got lost! That was the first time I learned an important principle of hiking up and down mountains: All routes lead to the top, but thousands of routes lead down, and very few of those will get you where you want to end up. In fact if the mountain is large, one can end up many miles from the desired place. That’s why I always stay on the trail going down a mountain, but know it is generally safe to bushwhack up to the top. Joe Hawley and Jackson Miller didn’t know that I would be bringing my wife and 3 small children along to the tower for the summer. Jackson told Penny he didn’t want the tower to have laundry hanging all over so that it looked like the grapes of wrath. Jackson also hobbled up (the man who had asked me if I had “injured” myself with the chainsaw had previously cut off part of his foot with an ax, but never mind!) because he said he couldn’t sleep knowing that our 3-year-old daughter was on the 45-foot tower that had only a couple of 2x4s for a railing around the outer catwalk. Below, on the ground, I found some old window shutters that served as beds for the children. Small as the kids were I could just tuck them in on a low counter and in the corner behind the wood stove. This was such an improvement over the freezing and fear I felt at Tule Bay makeshift campsite! Penny and I slept on the bed, which we modified to make it slightly wider than a twin-size. 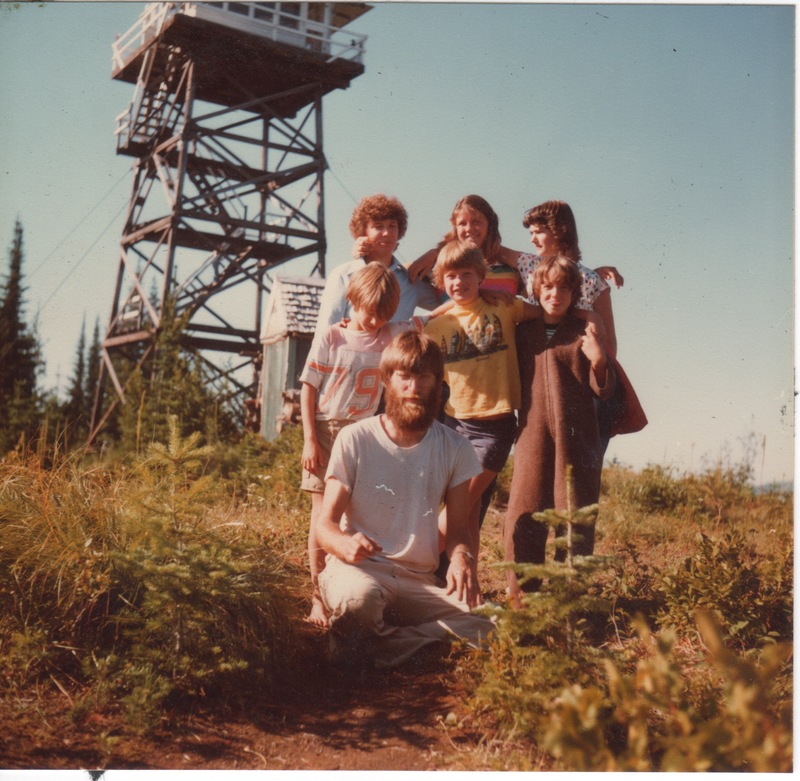 We five spent 3 summers at Priest Lake in the lookout tower, then one year at Seeley Lake, Montana, where I finally got checked out with a chainsaw to thin trees. Soon I strained my back and I’ve suffered the rest of my life. We lived in a tarpaper shack that was even larger than the cabin of the lookout at Indian Mountain. The 5th summer Penny got a job as lookout at Swede Mountain, so she took the kids. I got a pharmacy job in Billings. Staffing a lookout is the best job there is. One lives where one works, and the cabin is a work of art. It is simple carpentry, but excellent. It has built in cabinets and small-stature appliances around the periphery. The ceiling had a trap door with storage above for wonderful old relics from the days when lookouts communicated by telephone with fire dispatchers and other towers. The view from the lookout would be envied by anyone, since it has a full circle of blue sky, lakes, creeks and rivers, other mountains, beautiful valleys. The world is quite blue up there, and the view addicting. I used to look until my eyes watered and I couldn’t get enough. We got paid to look out the window and to report by FM radio telephone to the fire dispatcher four times a day. First Hughes Ridge, then me at Indian Mountain, then Mike Farmer at Gisborne Lookout. The rest of the day we watched for fires, or did any other chore we could dream up: paint, chop wood, build a shed, fell a tree that blocked the view, like that. We got paid for 8 hours, but if a lightning storm moved in we would get overtime. Sundays the air patrol fire lookouts brought us a newspaper. They buzzed the tower and dropped the paper on the second pass. It was the Spokesman Review, wrapped in plastic and masking tape, with some orange ribbons trailing behind. The kids searched in the alder bushes for the paper and it wasn’t always easy to find. The person dropping the paper always seemed to drop it too late, but we devoured the paper and we felt special, which was best of all. 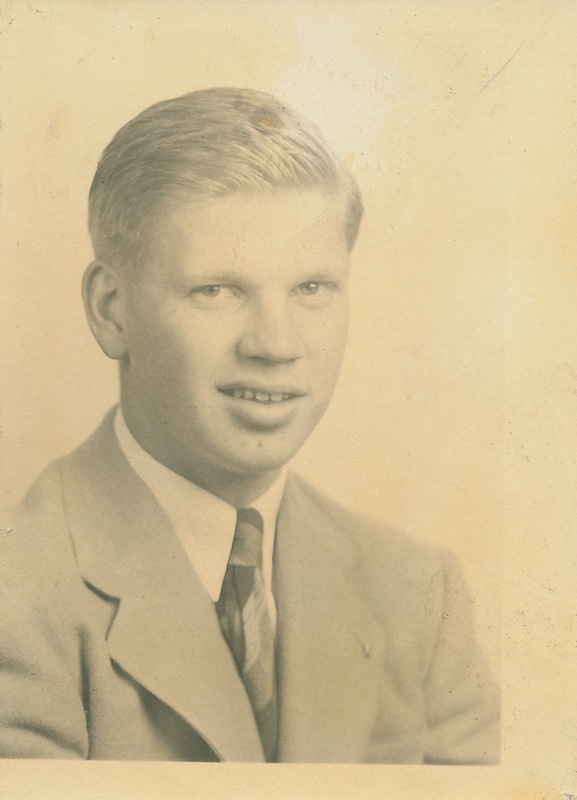 Carl’s high school graduation picture, 1941. I imagine my uncle Carl felt special too. He knew he was smart, because he took army tests and they told him he was. He could hike long distances. When the men were training in the deep South, in Arkansas, their captain made them hike more than the 10 mile/day limit by having them hike 10 miles until midnight, then having them hike a second 10 miles after. 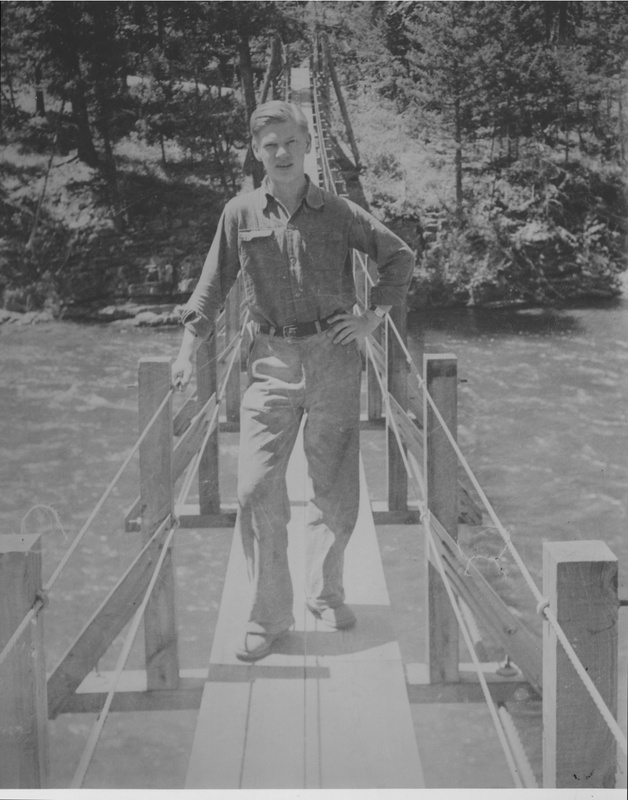 Carl and his buddies infuriated the older, less educated, soldiers by keeping up a bridge game on these arduous hikes. According to Bill Moomey, the guys kept their hands in their back pockets, then during rest periods and meals, would pull them out and do the bidding and playing. They’d shuffle and deal again, and put the cards back into their pockets. 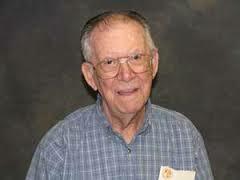 Bill Moomey, who died last year, was a close friend of Carl’s. He credited Carl with saving his life because the 66th Division had been devastated by the torpedo that struck the SS Leopoldville Christmas Eve, 1944. The 66th was assigned to the cost of France to contain German submariners in their bunkers. Carl was no doubt changed by the view from Huckleberry Mountain, which allows an overlook on three sides and the access ridge on the forth, the one to the east. Bill Moomey told me that Carl would rattle off a detailed description of the Mission Mountains and Flathead Valley whenever someone asked him where he was from. I was in the USMC about 20 years later when we still used WW II weapons and camping equipment, and I can vouch that a common question was to ask where are you from. Great post! By the way, that’s not Diane in the back next to Beth; it’s Me! I remember going with you all up to the lookout in your vs van, with the llama. Crazy summers!